Last year, it was decided to separate Council’s Achievement Awards from the Australia Day Citizen of the Year awards, to give better recognition to both. Council has moved its Awards to coincide with Local Government Week (30 July – 5 August), and Mayor Mark Honey is calling on people to nominate their local heroes. “Our local heroes are usually humble people who think that they’re not worthy of special recognition,” says Mayor Honey. Sports Award – for an individual who has achieved an outstanding performance (as a participant or administrator) in the field of sport. Last year’s recipient was Vince Hardman. Community Arts Award – for outstanding achievement or effort by an individual or group in the field of the arts. Last year’s recipients were Tamara Campbell and Dave Evans (above). Service to the Environment Award – for an individual or group that contributes to improving the environment within our community. Last year’s recipient was Howard R Jones. 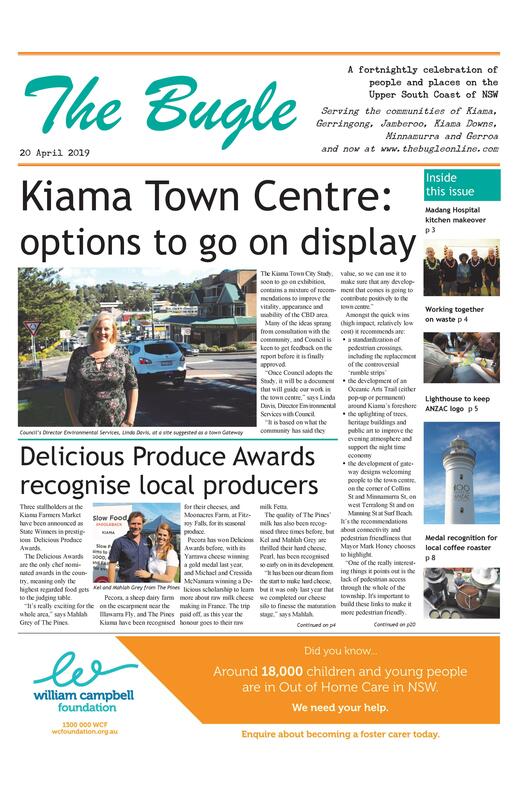 All residents of the Kiama Municipality are eligible for nomination. The Awards presentation will be held on Friday 3 August. Details: Nominations close Friday 6 July.